ADDRESS BY THE HONOURABLE MINISTER FOR TOURISM, ARTS AND CULTURE, HON. (MRS.) CATHERINE ABELEMA AFEKU, AT THE MEET THE PRESS PROGRAMME AT THE PRESS HALL OF THE MINISTRY OF INFORMATION ON MONDAY, JANUARY 29, 2018 AT 10:00 AM. It’s an honour to be here interacting with the Media as we take stock. I look forward to briefing you on the humble strides my Ministry and its Agencies have made since H. E. the President nominated me for the position of Minister for Tourism, Arts and Culture. I assumed office in February, 2017. First of all, I wish to commend all my predecessors, from the pioneering late Hon. Dr. Stephen Ayidiyah,Hon. Vida Amaadi Yeboah, Hon. Mike Gizo, the late Hon. Hawa Yakubu, Hon. Kwamina Bartels, the late Hon. Jake Otanka Obetsebi-Lamptey, Hon. Stephen Asamoah Boateng, Hon. Oboshie Sai Cofie, Hon. Juliana Azumah-Mensah, , Hon. Sabah Zita Okaikoi, now Mrs. Benson, Hon. Akua Sena Dansua to my immediate predecessor, Hon. (Mrs.) Elizabeth Ofosu-Adjare for what they achieved with the perennial and generally-acknowledged ministerial shoe-string budgets. As most of you may know, the Ministry of Tourism has, historically always been an appendage of other Ministries like Trade and Industry, Information, etc. In 1993, it became a full-blooded Ministry on its own but it was realigned in 2013 as the Ministry of Tourism, Culture and Creative Arts. In 2017, the Ministry was renamed through Executive Instrument E.I.1 Civil Service (Ministries) Instrument, 2017 by His Excellency the President as Ministry of Tourism, Arts and Culture. Ladies and Gentlemen of the Press, this policy directive seeks to provide a firm, stable policy environment for effective mainstreaming of Ghanaian arts and culture into all aspects of national life. This will ensure a strong revival of a vibrant creative economy to improve and advance the Tourism, Arts and Culture industry. Ghana Tourist Development Company (GTDC)- An autonomous, quasi public-private entity involved in the public sector development of the commercial aspects and investment in the tourism sector. It has the GTA as the major shareholder. In addition to the above, the Ministry is responsible for the Creative Arts. Distinguished Ladies and Gentlemen of the Press, the question has been asked, and rightly so: what are the achievements of the Ministry so far, if any at all? Now then, after giving you the background of the Ministry, its mandate and policy objectives, let me crave your indulgence and take you through my Ministry’s achievements over the just-ended year. The first official public function of the Ministry was to spearhead the organization of the Chocolate Day on February 14th, 2017 under the theme: ’Love Chocolate Love Adventure”. For the first time in Chocolate Day celebrations, we decided that everybody entering Ghana for the first time or who has been away for a while, must be welcomed into Ghana with some bars of the world-acclaimed brown chocolates of Ghana. My team and I were at the Kotoka International Airport for this exercise. March was a red letter month. We had barely settled in the seat when Ghana experienced its first major horrific accident in the tourism sector. A heavy downpour uprooted three trees at the Kintampo Waterfall resulting in fatalities. We ordered the facility shut down, and, with the Ghana Tourism Authority (GTA) working closely with the Field Engineers Regiment of the Ghana Armed Forces, undertook a massive rehabilitation of the attraction, with the appropriate safety measures being put on place. GTA has also done a lot of sensitization in the local community. The attraction was reopened to the general public by H.E. The Vice President, Alhaji Dr. Mahamudu Bawumia on November 19, 2017. Currently under a joint MOU between the Traditional Authority, the Municipal Assembly and GTA, the facility is under a joint management structure. Within 5 weeks of re-opening . the facility had almost 3,000 visitors. In May, Ghana participated in the United Nations World Tourism Organization (UNWTO) Executive Council meeting. It was our first since we came to office but we made an impact. We successfully negotiated for Ghana to be made the UNWTO Themis Regional Training hub for capacity building in West Africa. It comes with its own benefits, in addition to advertising Ghana as a Meetings, Incentives Conferences and Exhibitions (MICE) destination of choice. The first training workshop was organized for 70 public and private sector participants from Ghana, the Gambia, Nigeria, Liberia, Togo, Cameroun and Sierra Leone from 12th – 17th October, 2017. In June, the China Outbound Travel and Tourism Market (COTTM), the major travel and tourism fair in China, was held. Our participation bore unintended fruit, besides direct marketing of the country as a destination. Negotiations for Ghana to be featured on the global media market stage were begun here with CNN. This was followed up in Addis Ababa, Ethiopia, during the CAF Tourism Ministers meeting where the agreement was inked and sealed. Effective October last year, Ghana is now being featured on CNN, albeit via a teaser campaign, for starters. A crew of fourteen is expected to arrive in Ghana soon to work on the actual documentary. In July, PANAFEST/Emancipation Day, a major event on our calendar was organized in Accra, Cape Coast and Assin Manso. Activities started with wreath-laying ceremonies at the Du Bois Memorial Centre for Pan-African Culture, George Padmore Library and the Kwame Nkrumah Memorial Park, culminating in the Reverential Night at the Cape Coast Castle. 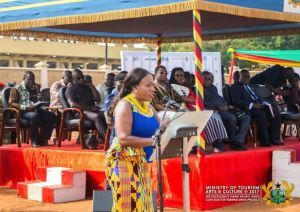 Tours within Ghana to familiarize myself and Directors of the Ministry and its agencies with tourist attractions as well as cultural and artistic initiatives in the regions were undertaken in the course of the year. In June, the team toured the Western Region, using the opportunity also to confer with stakeholders in the region. That tour revealed to the Ministry and the media the state of neglect of the grave of one of the founders of Ghana, GEORGE ALFRED GRANT, popularly known as Paa Grant. The Government was quick to respond, and in October, His Excellency the President performed the ceremony to unveil the rehabilitated grave of this illustrious son of the Gold Coast who passed on to glory just a few months before Ghana gained independence. In August a Hospitality Excellence Breakfast forum was held with key industry stakeholders at the Movenpic Hotel in Accra. It brought together captains of the industry and at the event a Service Charter for excellence was launched by GTA. This meeting kick-started t=a joint feasibility and stakeholder interaction held with stakeholders in all 10 regions. The team’s tour of the Northern Region in September also provided an opportunity to pay courtesy calls on Okyehene Amoatia Ofori Panin II at Kibi and Otumfuo Osei Tutu II in Kumasi to lay our plans before them and to drink from their deep wells of knowledge. The climax of the Northern tour was the unveiling of our first set of Tourism Ambassadors at a ceremony at Tamale to climax activities for the National Celebration of World Tourism Day 2017. Permit me, ladies and gentlemen, to pause a little to elaborate briefly on the role of Tourism Ambassadors. The Ambassadors are to champion a tourism and culturally-specific area of their interest, and to pursue a project reflecting that interest. I am happy to announce that so far about ten (10) ambassadors have submitted their project proposals covering tourism, arts and culture in their communities for implementation to serve as incubators for the youth. On the same tour, the Ministry commissioned the Gushiegu Smock Village, in fulfilment of Nana Addo Dankwa Akufo Addo’s One district One Factory promise. The ceremony was performed by the Honourable Minister of Tourism Arts and Culture. The World Travel Forum, which we won the right to host during the Turkish meeting in April, did take place in Accra in October. It was at the Kempinski Hotel Gold Coast City in Accra, and we can assure you that Ghana put its best foot forward, touristically and culturally. The foreign delegates, including other African Ministers of Tourism, loved the Ghanaian cuisine we placed before them at lunchtime. It was purely Ghana on display. In November, a TV licence was secured to operate Tourism TV to project our culture and the creative arts. Statutory Boards were inaugurated on November 21 for three out of five Agencies. The remaining two which could not be constituted due to technical reasons which have now been resolved, are set to be inaugurated into office latest by mid-February, 2018. Advisory Boards were also constituted for Six Agencies under the Ministry which hitherto did not have any Governing Boards. We believe that with these Governing Boards in place, we shall see an upsurge in their performances because of the enormous potential they wield. The tail end of our first year in office saw the take-off of the MARINE DRIVE TOURISM INVESTMENT PROJECT. This project intends to develop the entire parcel of land covering an area of 215.7 acres stretching from Osu Klottey lagoon behind the Christiansborg Castle all the way to the Accra Community Centre into a tourism enclave with modern facilities like hotels, malls, an amphitheatre, restaurants, a marina, among others. It has been on the drawing board since the 1960s by the government of the First Republic of Dr Kwame Nkrumah. Finally, in the first year of this government, the sod for commencement of work on this investment project, was cut by His Excellency the President of the Republic, Nana Addo Danquah Akufo Addo, in December 2017. A world-class Cocoa Museum is in the offing, to be set up at Mampong Akwapim in the Eastern Region. It is to be a public-private sector initiative primarily to encourage local consumption of cocoa. Besides the Tetteh Quarshie Farm which will replicate life on a typical Ghanaian cocoa farm, it will also take tourists through the processing of cocoa into a variety of products, including the powders, creams, beverages and wines, an exhibition centre that showcases the history, tools and background of cocoa farming in Ghana and a Boutique for the retail of made-in-Ghana cocoa-based products and other souvenirs. The drawings and feasibility reports are ready and we are proud to announce that a private partner has been secured. We use this forum to appeal to the various cocoa producing, marketing and processing companies in Ghana to come on board with top-up investments. Using the Kintampo MOU as a case study, the Ministry has identified 33 sites across the Country for some of partnership, upgrade or management improvement. To do this effectively , a Legislative Instrument on Attractions is in the works. The draft LI has been approved by Cabinet and is been sent to the AG’s office for final review before been sent to Parliament. To provide affordable accommodation to people who patronize the country’s tourist attractions, the Ministry is partnering with private investors to put up a chain of hotels across the country. We call them Akwaaba Hotels; and they are eco-friendly hotels conceptualized with the low budget tourist in mind, especially Ghanaian domestic tourists. These too, will be funded under a Public-Private Partnership arrangement through which the Government of Ghana, through the Ghana Tourist Development Company Limited, will use the land as equity while the private sector investor provides the funds for the actual construction. We can assure you that we have done the drawings , completed the feasibility studies and secured investor interest – from Ghanaians and foreigners . Indeed, some of the investors have gone as far as specifying which regions they want their Akwaaba hotels to be sited. They have gone far in terms of inking the terms of land ownership agreement with the allodial (land) owners. As you probably are aware, the high cost of accommodation has been identified, by previous administrations, as a factor inhibiting the successful development and promotion of domestic tourism in Ghana. It is the reason for low patronage of the tourist attractions. The NPP Manifesto for Election 2016 promised to position Ghana as a Meeting, Incentive, Conference and Exhibition (MICE) destination. We used our first year in office to lay the foundation. Ladies and gentlemen of the Press, I can announce that from 17-19th March, 2018 of next month, Ghana will host a West Africa Integrated Travel Forum which is expected to host Chief Executives of all tourism authorities in West Africa. Besides this stated goal, the forum will provide a platform for tourism administrators to share common experiences in the sub-region, attempt to find a common denominator for confronting these challenges and take advantage of mutual opportunities and come up with proposals on how to ease tourism flow between and among their respective countries. Ultimately, our aim is to replicate the East African example of “multiple destination marketing” whereby in-bound tourists from across the Atlantic will buy “one tour package” that will entitle them to enjoy the pleasures of multiple destinations in West Africa. In addition the Accra Tourist Information Center has been renovated and will soon be commissioned as a Convention and Visitor Bureau with the aim of focusing on attracting Major events into Ghana. Under the Ghana Tourism, Arts and Culture Sector Improvement Project, the World Bank has approved a US$50million grant to support the Ministry and its agencies to strengthen its institutions and stakeholders, improve sector productivity for job creation, empowering women and youth across all sectors along the creative arts and culture value chain as well to enhance overall domestic/foreign tourist experience. It is the first time in the history of Ghana that the industry has been supported by the World Bank after interventions by the Minister of Arts and Culture and the Minister of Finance. Ghana is the centre of the world. It is not what we say: it was determined by the authorities and powers of this world, at a meeting which took place almost a century before Ghana became a nation. The Ministry, in collaboration with the Ghana Ports and Harbours Authority, the Tema Golf Club and the Tema Community One Presbyterian Church intends to market this phenomenon. We know that religiously, this is a seller. Already, people are finding their way to the Presbyterian Church at Tema to pray at the centre of the world. Our first President, Dr Kwame Nkrumah, used to embark on pilgrimages to that part of Tema once a year for a spiritual retreat. We believe that with good marketing, people could be attracted to have their weddings at the centre of the world, set up businesses and advertise that their goods were manufactured at the centre of the world. Linking up with other countries on the Greenwich Meridian, there is so much we could benefit from that association. The Tema Golf Course could be accredited to host tournaments at the centre of the world, including the likes of PGA tournaments. The Ministry is embarking on on a highway rest stops project . the first of such eco-friendly highway stops will commence soon at Gomoa Assin – between Apam Junction and Mankessim. Other areas earmarked are Agona Junction , Assin Manso and between Kintampo and Tamale. Within the year , the Ministry provided funding to the Ghana Tourism Federation (GHATOF) to start some industry training . Training of the informal sector was held in Accra and Cape Coast. In September, the Hospitality, Tourism and Catering School (HOTCAT) begun a joint project to rehabilitate, refurbish and restructure the institute. Work is currently ongoing and by March this year, in-house training courses will start. HOTCATT will then be commissioned to be the pivotal institute for industry training and capacity building. Under the rejuvenated HOTCAT, 10 satellite regional campuses will be established to take training across the Country . The HOTCAT mobile school is work in progress. Given the mandate of the Ministry, we usually do not wish to single out any one of the sub-sectors for emphasis. We believe that in promoting Tourism, we promote the nation’s arts and culture. The corollary is also true: we promote arts and culture to feed tourism. In our scheme of things, therefore, each of the three sub-sectors carries equal weight in policies, our planning and our activities. For example, while many consider the ‘See Ghana, Wear Ghana, Eat Ghana and Feel Ghana’ initiative as a tourism programme, even a cursory observation will show that the activities that are held to promote the concept are creative arts and culture-based. In ‘Wear Ghana’, we invite Ghanaians to patronize local fabrics and fashion, whose practitioners are listed as domains in creative arts and culture. In ‘Eat Ghana’, we are promoting local cuisine, an area that lies in the domain of culture. When this campaign sinks into the national psyche, the end result would sustain the tourism, arts and culture industry. Be that as it may, the Ministry made it a conscious policy to give arts and culture, specifically, their pride of place. Though the Creative Industry Bill is yet to be passed into Law as an Act, we are pleased to announce that the Creative Arts Council Secretariat has been established and is fully functional. An interim executive has been put in place to oversee the affairs of the creative arts sector until elections are conducted. As you are aware, the Creative Arts sub-sector is a broad one, with multiplicity of domains, including beauticians and hairdressers. True, theirs is also art. It is just so that no-one is left out in the implementation of policies and programmes that we continue to encourage the holding of broad consultation to bring everybody on board. As I speak, research is being conducted by sections of creative arts practitioners to gather and analyze data to form the basis for policies and programmes. Such data will enable the disbursement of budgetary support by the Ministry to identifiable groups and domains. Still on the Creative Arts, the Ministry recognized very early in its first year the perennial issue of creative artists living in penury while their intellectual property enriches others. In consultation with some stakeholders, we identified one of the causes as the challenge of monetizing creativity. Artistes, be they film or music stars, producers or creative directors, who feel their toils are not being properly compensated financially, will always be reluctant to invest their talent any further. This is what partly accounts for the absence of quality material locally to compete with the ‘Khukum Badjahs’, the ‘Mary Kruz’, ‘Bold and Beautiful’, ‘Veera and Doli Armaano Ki’ which have captured the hearts of TV viewers in Ghana. As a government that believes in private sector initiatives, we do not think that the answer lies in legislating content. We also recognize the efforts of XYLOPHONE TV who are into the business of putting money into the pockets of Ghanaian artists. Their latest creation, “Xylophone Cash”, is also an attempt to monetize creativity through a system of uploading Ghanaian movies to run via social media and paying the creative people by the number of hits their works attract. We commend the initiative. Over a period of time in our first year, we have been in talks with a private sector operator who is into the business of placing Ghanaian content at the disposal of viewers throughout the world. Artists will be signed on to produce popular content – including already existing content – that will run as a series in the name of the artist. I am happy, this morning, to announce that the first in the series, titled AGYA KOO TV, will be premiered next Sunday at Accra Mall. Barring any obstacles, a DADDY LUMBA TV will be ready next month. As an app, one does not have to have a TV set to watch Agya Koo TV or Daddy Lumba’s series oan Daddy Lumba TV. Wherever you are in the world, all you need is a smart phone. Ladies and gentlemen, we are proud to announce this as the Ministry’s PPP initiative. Like the other projects in both tourism, arts and culture, such initiatives take months, some even years, to negotiate and bring into fruition. Please, bear with us. To showcase the works of industry players, the Ministry has facilitated the setting up of television station dedicated to the tourism, arts and culture industry. We are convinced that this station will become functional soon. Ladies and gentlemen of the Press, these are the modest achievements of the Ministry of Tourism, Arts and Culture thus far. We have not realized all our dreams; indeed, it is impossible to do everything in one year. We believe, however, that we have laid the foundations for a total fulfilment of all the pledges the NPP set out in its Manifesto for Election 2016. For a take-home, please, remember: this is only our first year. There is more where these are coming from, and with God on our side, with dynamic leadership, a dedicated and highly motivated staff, and with your criticisms and suggestions, we shall succeed. Let me assure you that we are aware that many of you have terrific ideas about how our sector can succeed. Please, you are welcome to share these with us. I am not talking about only here at this Meet The Press event, but also later on. Those who could not make it here are also encouraged to share their rich ideas with us on our various platforms. Our doors are open and we shall continue to keep them open. Thank you, and God bless us all.